This recipe was inspired by one from Deborah Madison’s 2013 cookbook, Vegetable Literacy (Ten Speed Press). Deborah is chef, teacher and prolific cookbook author who lives in New Mexico. One key to success with this recipe is to squeeze every last drop of the water from the soft, blanched chard; this may require several rounds of muscle-flexing! Draining as much liquid from the ricotta cheese as possible is also essential; it works well to drain it overnight. For every cup of ricotta, you should be left with about two tablespoons of water to discard. The batter for these cakes can be made several hours in advance and refrigerated until you're ready to cook them. Build a meal around these cakes with a salad on the side, or serve them next to an animal-based protein. If you prefer yogurt to sour cream, it can be substituted for the topping. Bring a large pot of generously salted water to a boil; you'll use this water to cook the amaranth after you blanch the chard. When the water is boiling vigorously, add the chard leaves and cook for 3 minutes. Remove the leaves from the water with a large slotted spoon or tongs into a colander and run under cold water to cool. When the chard has drained and cooled, use your hands to squeeze the remaining water from the leaves before chopping them finely and setting aside. 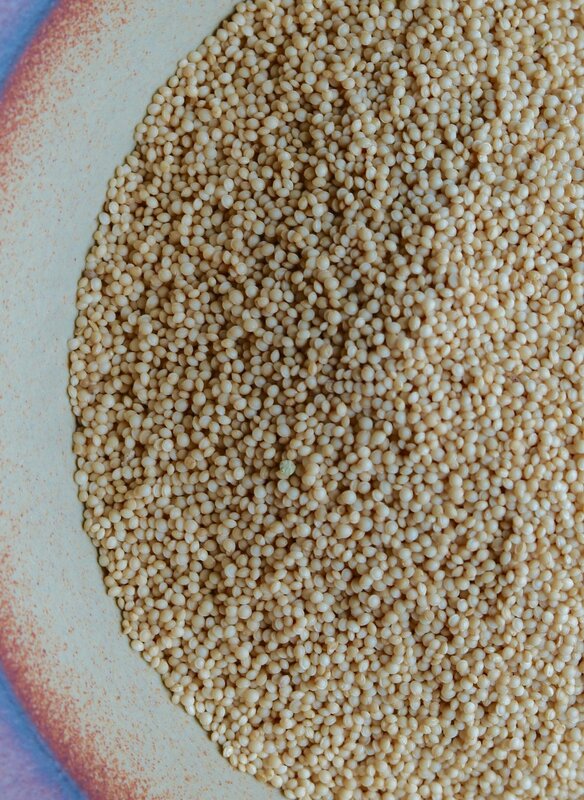 Return the water to a boil over high heat and add the amaranth when it is boiling vigorously. Cook 4 minutes, strain using a fine mesh sieve, and spread out on a plate to cool. Stir together the rice and amaranth flours, salt, cayenne pepper, lemon zest, and baking powder in a bowl. In a separate bowl, mix the ricotta and Parmesan cheeses, buttermilk and eggs until well-blended. Add the oil and whisk in the dry ingredients until the batter is thick and sponge-like. Fold in the chopped chard and let the batter rest for a few minutes before cooking or chill for a several hours. Lightly slick the bottom of a wide frying pan with few tablespoons of the neutral oil. Heat the pan over medium-high heat, and when the oil is hot, reduce the heat to medium-low. Add small spoonfuls of batter to the pan to make little (about 2-inches in diameter) pancakes. Cook and lightly brown, about 3 minutes per side, before removing the cakes from the pan. Keep the cakes warm while you cook the remaining batter. Serve the warm pancakes with a spoonful herbed sour cream, freshly ground black pepper and grated lemon zest.